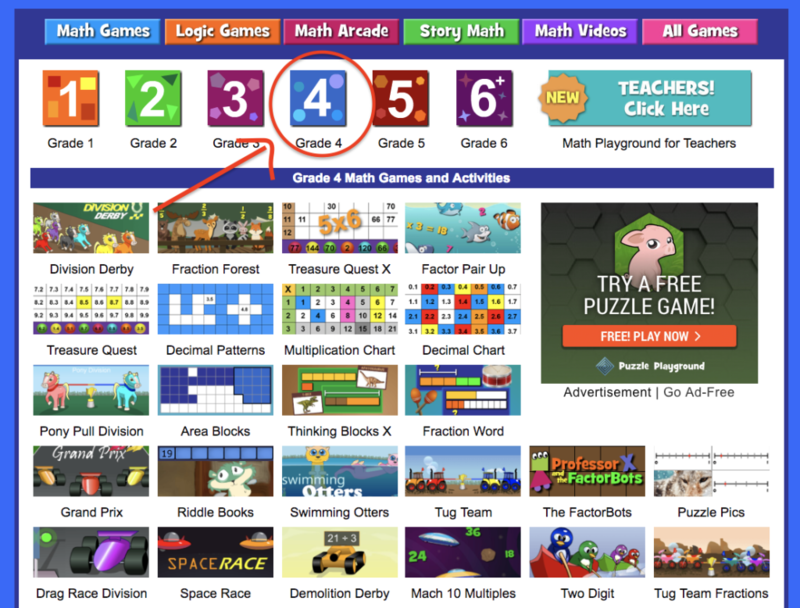 Math Playground is currently one of the leading online math game providers on the web! The site is filled with math games, logic puzzles, and a variety of problem-solving activities. Since their start, back in 2002 by Colleen King, it has helped millions of students eliminate math stress and develop the confidence needed to be successful; in a fun and engaging way! We are very excited to review this site and provide you with a resource to understand how to efficiently navigate Math Playground, so your student can witness the benefits Math Playground has to offer. PS: Since you are on this page, you may also be interested in our “Top 10 Math Websites Blog Article” that dives into the best math websites on the web! Math Playground was designed for teachers, classrooms, and individual students in K- 6th grade. All games are FREE, but if you are a teacher and want to remove the ads for your classroom, you can pay a small monthly fee of $14.99/month billed annually, or $19.99 per month charged monthly. This includes access for up to 30 different students! If you are interested in a premium account, you can learn more here! Every game has been created by a credentialed teacher, and is based on common core math standards. Navigating Math Playground by 1st, 2nd, 3rd, 4th, 5th, or 6th-grade level. All you have to do is click “Grade 1”, “Grade 2”, “Grade 3”, etc. or one of the six categories and you will be directed to resources in Math Playground relating to that particular math grade-level or category. 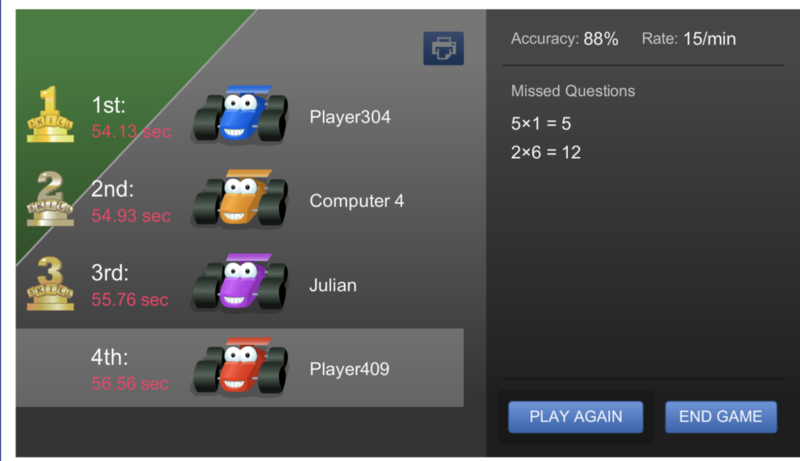 The image below gives an example of when you click “Grade 4” on the Math Playground website. As you can see, there are dozens of games that a 4th-grade math student can play! 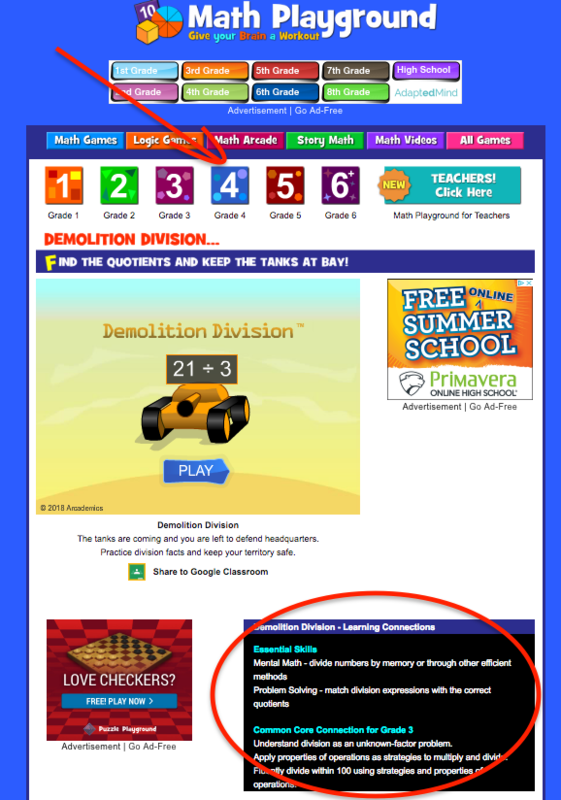 From understanding how division works, fractions, factors, multiplications and more… Math Playground has a game that students can enjoy while honing in on essential math facts! In addition, whenever possible, they’ve attempted to cross-reference their games with the Common Core Math Objectives they meet. These references can be found beneath each game or activity, as shown below. Now that you have a general idea of what Math Playground is and how to go about navigating it, let’s dive into how to browse this website to find the best resources for your needs. If you choose to search based on the grade level you will see that each grade level is further grouped into three different sections. This includes games students can play on an individual basis, along with activities the teacher can assign students. Based on what grade-level you are searching for, you will find a ton of helpful resources to aid your student with their current mathematical difficulties. This includes different math games that students can play on an individual basis, and are focused on improving analytical thinking or logic. This includes different math word games and math arcade games that students can play together! A more in-depth explanation of word games & activities can be found below, where I discuss the six different categories that Math Playground is broken up into; with category #3 and #4 being “Math Arcade” and “Story Math,” respectively. In addition to being broken up by grade-level, Math Playground is also further categorized by six different categories (Math Games, Logic Games, Math Arcade, Math Videos, and All Games). Here, we provide a detailed analysis of each category and how to go about navigating it the most optimal way. Here, you will find the different math games that students can play on an individual basis. These are focused on learning math facts like addition, multiplication, fractions, etc. Math Playground’s math games are then further categorized into subsections, like “Addition and Subtraction,” “Multiplication & Division,” “Fractions and Decimals,” and “Geometry and Graphing,” as shown below. Here, you will find different math games that students can play on an individual basis. These are focused on improving analytical thinking and logic. Math facts math arcade games. Fraction, decimal, ratio, and integer math arcade games. Shapes, counting, money, and time arcade games. To play together, you just need to be on different computers and start the same game at the same time. When you start the game, you will be prompted to enter your name. Afterwards, click continue > play game > and then you should see friends who started the game on the same screen! Now, it is time to race! Throughout the game, depending on the game you are playing, you will be prompted to solve small math problems like multiplication tables, division, logic, geometry, etc. In this particular game called “Drag Race Division,” you are prompted to answer multiplication tables to get your race car to go faster. At the bottom, you will also notice the common core connections for grade 3: Understanding of division as an unknown-factor problem. Apply properties of operations as strategies to multiply and divide. Fluently divide within 100 using procedures and features of operations. So far, the Math Playground math arcade games are my personal favorite! Go check them out for yourself by clicking here! Here, you will find math games focused on word problems. Since word problems also require a bit of understanding of reading, they also have a couple of dozen reading games that you can find at the bottom of the page to help students improve their word recognition, letter recognition, parts of speech, etc. I am not sure about you, but when I was in school… word problems were the MOST DIFFICULT! Although these games were not as fun as the arcade games, they do a great job of helping students master word problems in the most fun and engaging ways possible. Here, you will find fun, engaging math videos to help students further master essential math concepts. Section #1: Animated videos covering a variety of topics from bar graphics, intro to multiplication, elapsed time, line plots, and more. Section #2: Additional videos taught by a real person, broken up into over a dozen categories. 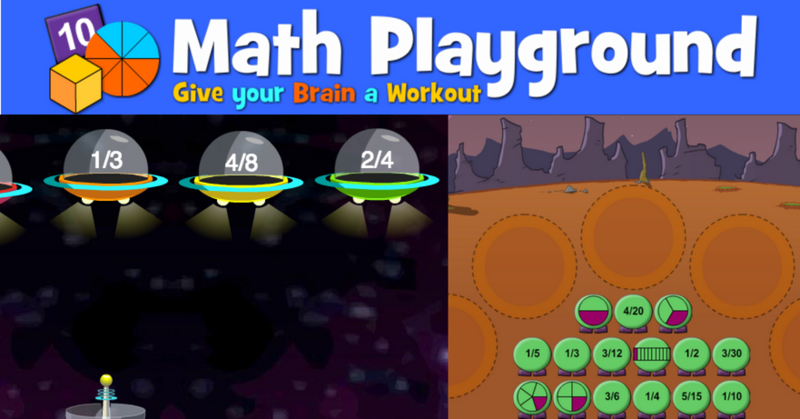 Here, you will find all the different math games that Math Playground has to offer! Thinking Blocks: All thinking blocks programs. Addition & Subtraction: Counting, missing numbers, sums, addition through 100, number puzzle, etc. Logic Games & Puzzles: Over a hundred different games that fall under all four categories above! Multiplication and Division: Patterns, factors, division, 2 digit multiplication, etc. Fraction , Decmilas, and Percent: Unit Fractions, decimals, percent, equavilant fractions, decimal words, etc. All Four Operations: Order of operations, basic number operations, number puzzle, modeling word problems, etc. Counting & Time: Counting, time words, telling time, analog and digital time, etc. Money & General Math Knowledge: Money and decision making, coins and addition money, counting money, etc. Geometry: Transformations, angles, velocity, rotations, naming shapes, etc. Ratios, Integers, and Number Puzels: Ration and proportaion, equal rations, visual equations, exponent expressions, etc. Math in the Real World: Art and math, area and perimeter, etc. Spelling, Grammer, and Geography: Grammar, antonyms, homonyms, double vowels, spelling, etc. Super Teriffic Fun Games: Apple Boo, Run, Run 2, Space is key, and many more! If you have a K – 7th-grade student or are a teacher teaching K – 7th-grade math you are going to want to check out Math Playground! The games are not only fun and engaging, but they do their best to make sure every lesson aligns with the Common Core Math Standards. What questions do you have? What are your student’s most difficult math challenges? Please let us know in the comments below or send us a message via Facebook Messenger!